The Purbeck maintains the Imperial tradition of providing a combination of efficient and thoughtful design with a highly appealing price. 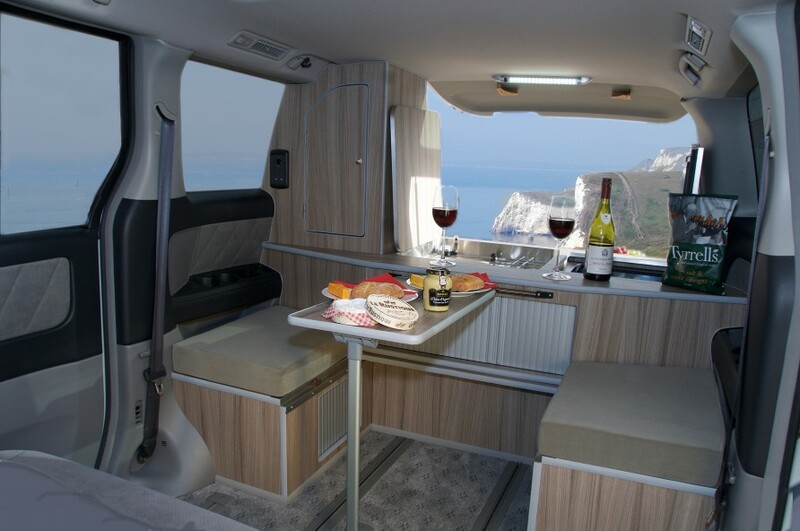 The next generation of our highly acclaimed range of campervan conversions based on the Toyota Alphard, the Purbeck is the first to offer a rear kitchen conversion. It maintains the Imperial tradition of providing an unbeatable combination of efficient and thoughtful design with a highly appealing price. interior in less clement weather. The two-burner hob in the Purbeck’s kitchen was specially chosen to be equally usable from inside and outside the vehicle: the controls can be easily reached without leaning across hot pans or searing flames. With access from both sides, two cooks can feed hungry mouths as fast as one. 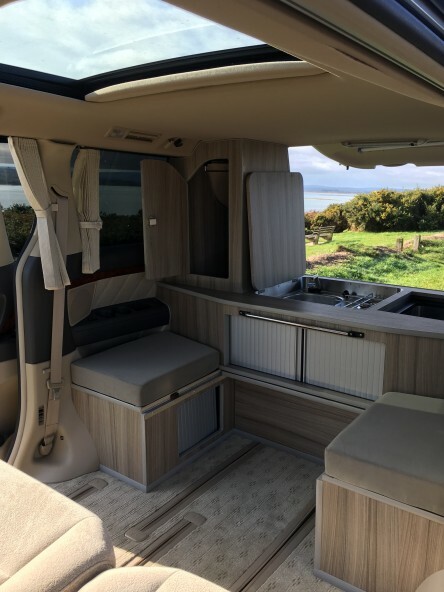 With the substantial cover in place over the hob and its matching integral sink unit, the available surface for food preparation would outdo many a motorhome. 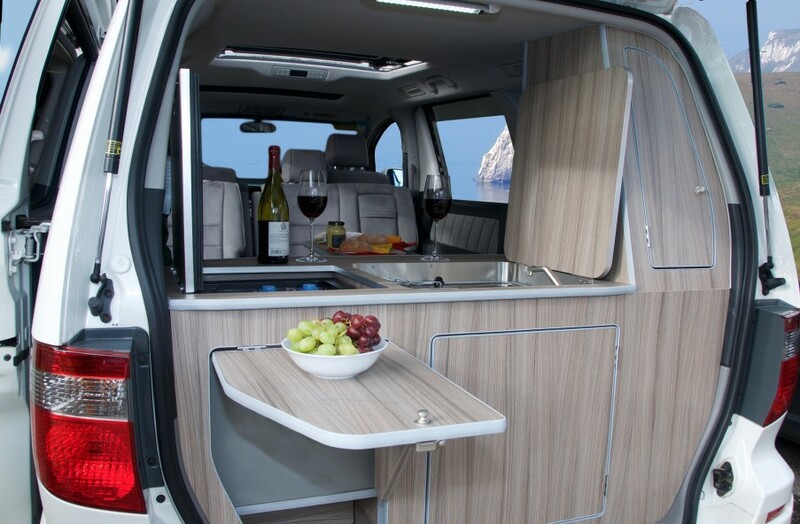 Even more space is available to an al fresco chef, thanks to the ingenious fold-up table incorporated into the rear panel. Even the storage cupboards open both front and rear. The portable 10 litre tank with submersible pump is a highly cost-effective source of on-board running water requirements, while the adjacent gas locker accommodates a Campingaz 904 bottle. Does it have a “fridge as well as the kitchen sink?” Of course there’s a refrigerator! The Waco 36 litre compressor unit will respond immediately to your sudden impulse to take the kids away for a sunny weekend’s camping. A leisure battery provides on-site power for the refrigerator, lights and other 12 volt accessories when there is no mains hook-up. When there is, electrical power is managed by an automatic control unit and, safety once again, an RCD and trip switches. Hook up to a 240V supply so any home appliance can be safely used - heater, toaster, T.V, the choice is yours. seats. With the original outer 3 point seat belts & middle lap belt up to 5 people can be securely carried in absolute comfort. Add to that two integral ISOFIX mounts, the internationally standardised child seat fitting system, and you have the protection of the quickest, easiest and safest way to carry your family. In addition to the comfortable travel seats there are forward and side facing rear seats for lounging and dining. You can easily sit four people round the table. Storage lockers feature tambour doors so you can’t trip over them when they’re open. Low energy LED lighting casts a warm glow as the evening draws in. The original travel seat easily folds down to provide a full-width bed, together with an integral slatted base, making set-up a simple operation! With Imperial’s specially designed optional mattress offering you the luxury of a 6’1” x 4’9” perfectly flat double bed you are guaranteed a cosy night’s sleep. 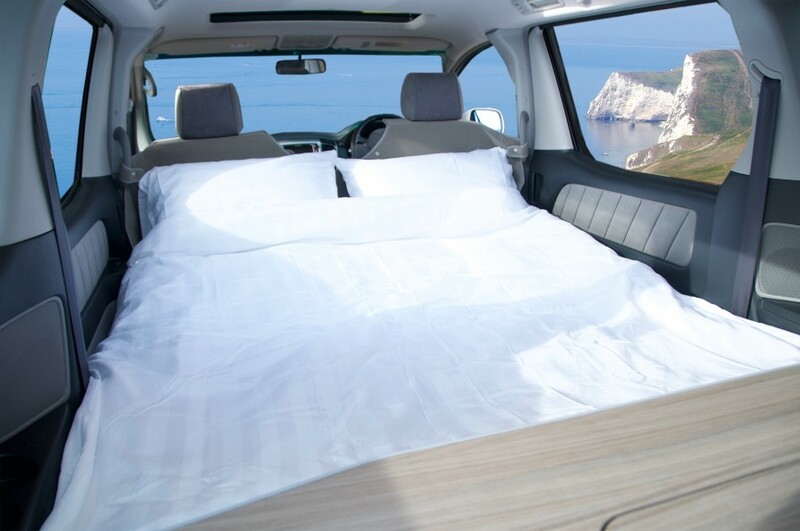 Add the gas-assisted rising roof to your Alphard and children will love their own cosy overnight perch up top. Optional tailor made silver window screens add privacy and security. 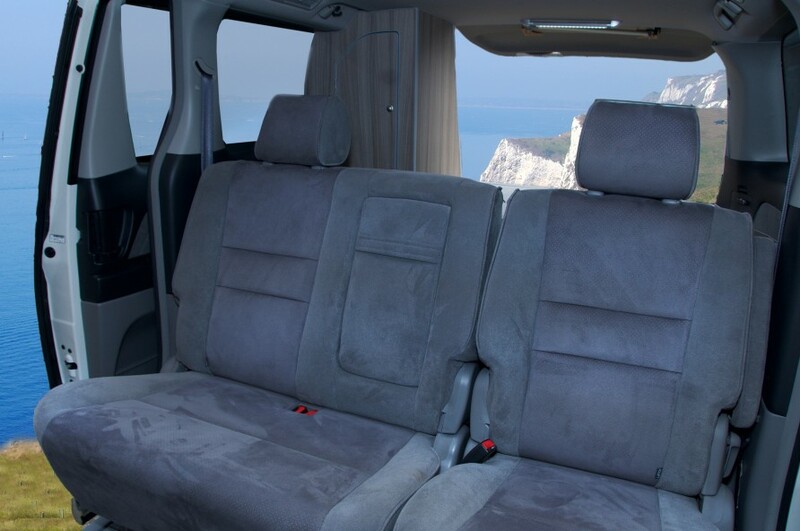 The Purbeck conversion retains and utilises the Alphard’s fully crash tested factory fitted middle seats. With the original outer 3 point seat belts & middle lap belt up to 5 people can be securely carried. The middle seat is equipped with two integral ISOFIX mounts, the internationally standardised child seat fitting system. 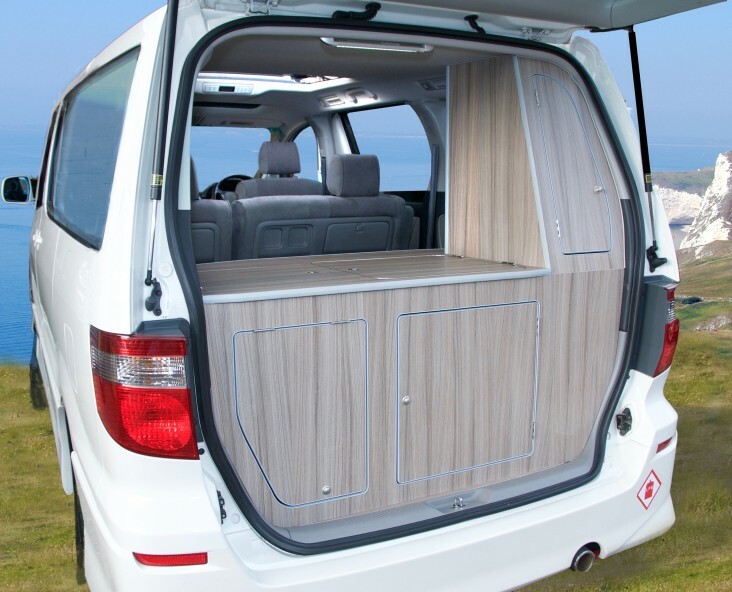 This seat can be simply turned to face the rear when camping and easily folds down to provide a full-width bed, together with an integral slatted base, making set-up a simple operation. Our specially designed optional mattress offers you the luxury of a 6’1” x 4’9” perfectly flat double bed. Gas assisted colour coded lifting roof, mattress/cushion set, Bluetooth Radio/CD/DVD/USB/SD Card/Touchscreen/SatNav (UK & Europoe), tow bar, bike rack, roll-out side awning, Waxoyl, Porta Potti, blown air heating.